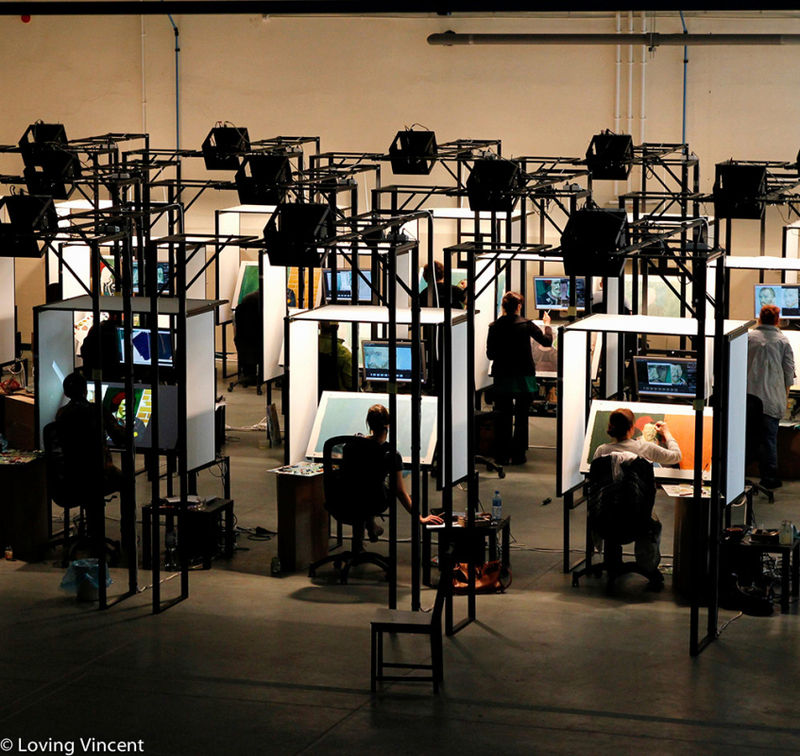 Loving Vincent, the documentary animation about Vincent van Gogh, is set to make cinematic history as the world’s first oil-painted feature-length film. The film narrates an investigation that focuses on the life and death of the world renowned painter Vincent van Gogh. An artist known for his famous ‘The Starry Night’ painting, cutting off his ear, struggling with mental illness and often regarded as the father of modern art. The masterminds behind the writing and direction of Loving Vincent, are a Polish painter and a British filmmaker, Dorota Kobiela and Hugh Welchman. Kobiela and Welchman have undertaken a highly ambitious form of storytelling to produce the gargantuan project through their acclaimed Oscar-winning animation studios, Breakthru Films and Trademark Films. Kobiela’s inspiration to create this project was from one of van Gogh’s letter to his brother: “he said we can only speak through our paintings. And these words were very important for me, and they were actually the reason we are making this film like that.” Both creators are in the arduous process of pioneering the aesthetically appealing visual form of storytelling by blurring the lines between filmmaking and 0il-painting in the history of cinema. The film is narrated through dramatic reconstruction of the poignant events of his controversial life until his tragic death, through the use of characters who were close to van Gogh, in the form of interviews. The voicing star cast for the film includes; Robert Gularczyk (Vincent van Gogh), Saoirse Ronan (Marguerite Gachet) Aidan Turner (Boatman), Douglas Booth (Armand Roulin), Helen McCrory (Louise Chevalier), Eleanor Tomlinson (Adeline Ravoux), Chris O’Dowd (Postman Roulin), Jerome Flynn (Dr.Paul Gachet) and John Sessions (Pere Tanguy). 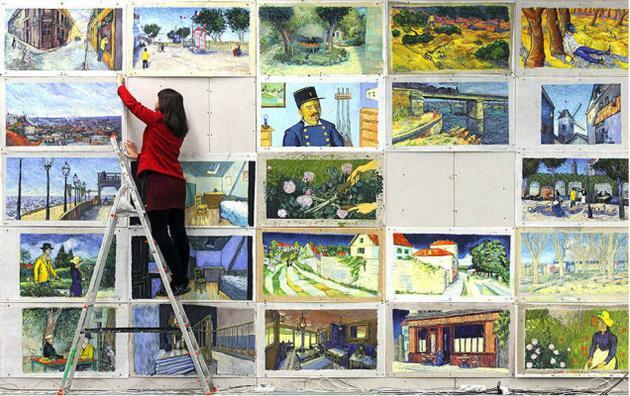 The film’s narrative is derived from 800 letters written by van Gogh and over 120 cannonised paintings of him are being featured in the film to support the narration. The immortal words of Van Gogh from one of his letter’s to his brother in 1890 is the driving force behind Loving Vincent as the film narrates his life, just as it’s seen through his paintings and characters. 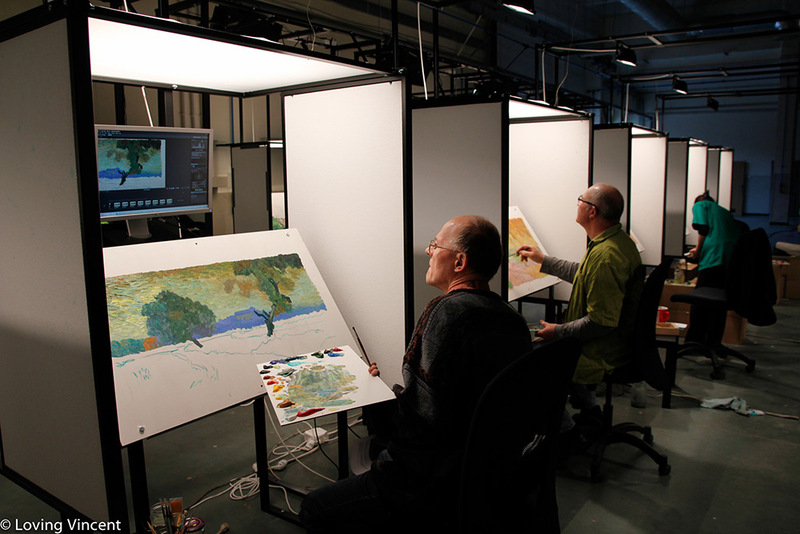 The production team created a Painted Animation Work Station (PAWS) – an efficient platform to maintain the arduous process of stop-motion painting that aids their oil painters to give their undivided focus to the demanding painting process, without concerning the animation side. As seen below PAWS allows individual artists their space to concentrate on their painting. Welchman began a KickStarter campaign in February 2014, to have over 100 professional oil painters trained for the project to be animators. Each of the talented oil painters went through a three-day audition before they could start their 180-hour training to paint like van Gogh. So far over 796 individuals have pledged over £50,000. Loving Vincent is a highly creative use of post-impressionism to document the tragic legend of the tortured genius artist. Kobiela and Welchman’s innovating filmmaking will land their hand painted documentary into the pool of canonical films as one of a kind of captivating cinema. This new form of filmmaking, bringing the paintings to life, will indeed open new and different avenues for filmmakers to experiment and create a project that has not been undertaken before. 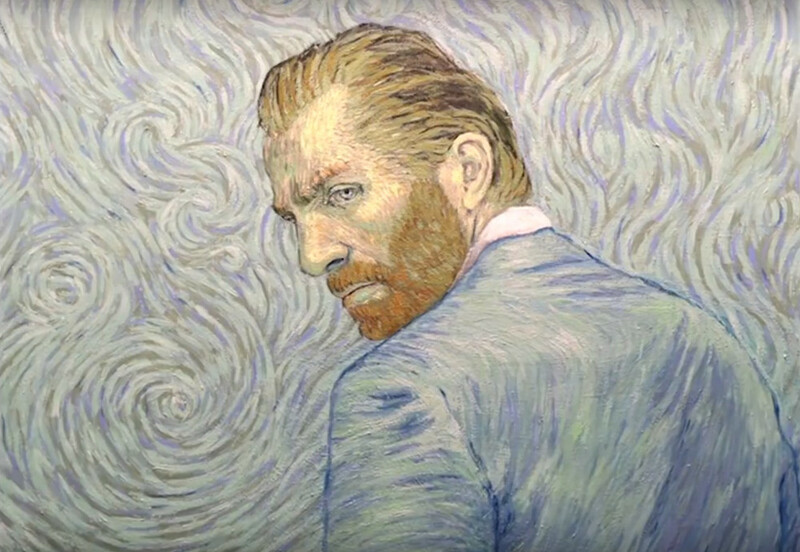 There has been immense anticipation and hype since the release of the concept trailer for Loving Vincent. The final release date of the film is yet to be released as the project is estimated to take over two more years to complete.